Rosewater is one of the most inventive science fiction novels I’ve read in a long time, and I dearly hope it gets more attention. Nigeria, 2066. Kaaro lives in the city of Rosewater, a settlement that grew up around an alien biodome. He spends his days providing psychic protection for a bank, but secretly, he’s the most powerful psychic of Section 35, a secret agency within the Nigerian government. As other psychics begin dying one by one, Kaaro will defy the agency to find an answer. I absolutely loved the world building of Rosewater. 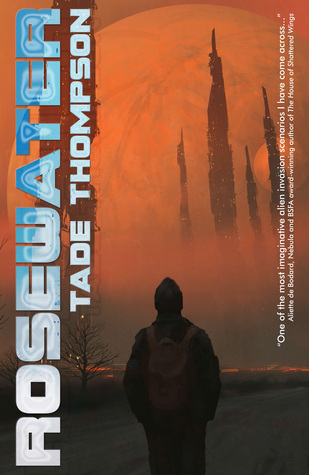 Thompson brings his futuristic vision of Nigeria to stunning life, complete with psychics and strange alien organisms. There’s so many interesting ideas at play, from the biodome itself to conundrum of America “going dark” to aliens landing in London in 2012. And yet the book never feels cramped or overdone. While the story stands on its own, I desperately want a sequel so that I can see more of this world. Rosewater skips between multiple different timelines. The book starts in 2066, and that could be considered the main timeline of the novel. However various interludes reveal Kaaro’s backstory: how he gained his psychic powers, how he came to work for Section 35, and some of the mysteries behind the rouge Bicycle Girl and the biodome itself. With multiple timelines, it can be a real challenge for me to stay invested in all of them and not want to skip ahead to one or the other. However this format worked fabulously in Rosewater. I felt equally involved in all of the storylines, and I loved how they came together. Kaaro has decidedly antiheroic tendencies. He’s something of a coward, and before he came to work for Section 35 he was a thief. He’s also a fascinating first person narrator. His narrative voice is detached and matter of fact, almost bland. Combined with what we know of Kaaro’s life, it makes me suspect that he’s depressed. Of course, Kaaro does have some growth throughout the story. He slowly becomes more involved and attached to his own life and the people in it. While I don’t know if he’s someone I’d want to be friends with, he was interesting to read about. As for side characters, I’ll note that it’s not astounding on female characters, but it is tolerable. I enjoyed every moment of Rosewater. While I hope that Thompson writes a sequel at some point, I think I’ll be checking out his back list regardless. This is a book I’d highly recommend. I received an ARC of Rosewater through Netgalley in exchange for a free and honest review. I’m so glad more reviews for Rosewater are popping up, because it does deserve more attention. I loved this too, and I can’t wait to read something else by Tade Thompson. I think it just got put up on Netgalley recently, hence the reviews. I’m glad you like it too! Ooh, excellent! I’ve never heard of this author or this book but it sounds right up my alley. Thanks for reviewing!